"Riding to raise awareness and funds for Action Bladder Cancer UK because their essential work has impacted on our family." A few years ago, Mark's father - Gordon - was diagnosed with bladder cancer - a very worrying time for them all. After treatment and surgery his dad recovered well and for ongoing support he became involved with the Wolverhampton Bladder Cancer Support Group. Mark has fundraised for charities before and wanted to raise money to go directly towards work on bladder cancer - and so he chose to support the work of Action Bladder Cancer UK. Mark was also fundraising for ABC UK on behalf of the Wolverhampton Bladder Cancer Support Group and the members of the group also donated to ABCUK to support Mark's fundraising. Mark is Wolverhampton born and bred - he left Wolverhampton to join the RAF (following in his father's footsteps, Gordon was also in the RAF for many years). He then joined the West Midlands Police and is currently with Dyfed Powys Police. Mark's main fundraising event was the Prudential Ride London 100 mile race - a particularly challenging cycling event - although he also took part in a shorter event a few weeks before as a ‘warm up'. Mark worked very hard to fundraise over several months in the run up to the Prudential race (it is an idea to give yourself plenty of time to fundraise) and his colleagues in the Police were very supportive and he also got help from local businesses. In the run up to the race, after weeks of no rain, blazing sunshine and temperatures above 30C, Mark was more concerned about the heat. However, on the day - the weather broke - and the ride itself took place in thunderstorms and torrential rain,making it even tougher. 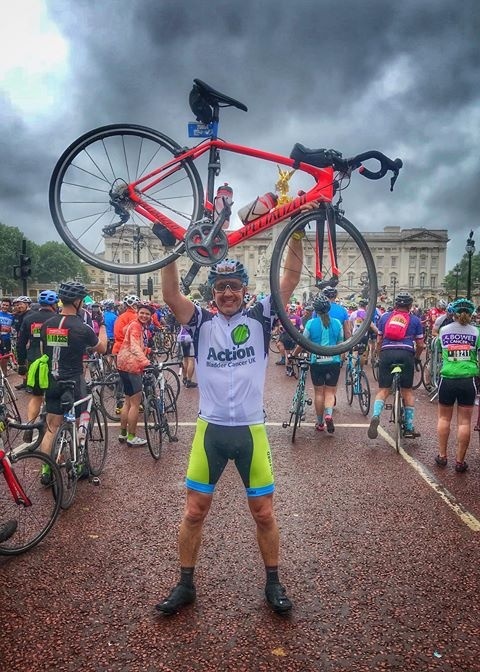 Despite this, Mark finished the ride in a very impressive time of 5 hrs 43mins outside Buckingham Palace in London - and held his bike above his head in celebration! Mark tweeted immediately after the race "One of the wettest, windiest rides I've done! 100 miles in 5hrs 43mins raised £2520 for ABC UK! I'm feeling chuffed and a little emotional! Probably the only medal I'll get at Buckingham Palace!" Mark has been amazing - he worked at fundraising for several months and trained by doing long distance rides to build up for the event. We have been so impressed with his determination and commitment to raising funds to support Action Bladder Cancer UK's much-needed work and to raise awareness of bladder cancer. He really is a star and we are very proud of him ... We'd also like to say a big thank you to the Wolverhampton Bladder Cancer Support Group for supporting Mark and our work. They're a great group and we know that they, and Mark's father, are very proud of his achievement.